Vanilla chocolate cookie with Belgian chocolate chips. Save 15% with a case of 20 in a display box. Our version of the ever popular vanilla chocolate chip cookie made with Belgian chocolate chips. 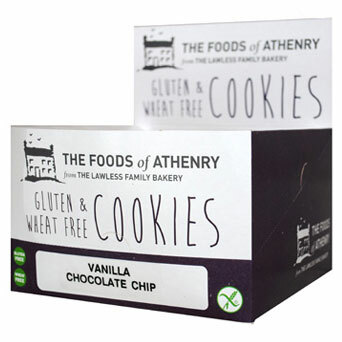 Maize, Rice, Potato, Tapioca & Buckwheat Flour, 100% Vegetable non-hydrogenated Margarine, Sugar, Belgian Chocolate Chips (Soya) (7%), Concentrated Fruit Juice (Grape, Apple, Pear), Raising Agents (Mono Calcium Phosphate, Sodium Bicarbonate), Natural Vanilla Flavour, Stabiliser: Xanthan Gum. Margarine contains Vegetable oils (Rapeseed, Palm - from sustainable sources), Water, Salt, Emulsifier: E475; Natural Colours: (Annatto, Curcumin), Natural Flavouring. Chocolate chips contains Sugar, Cocoa Mass, Cocoa Butter, Emulsifier-soy lecithin, Natural Vanilla.